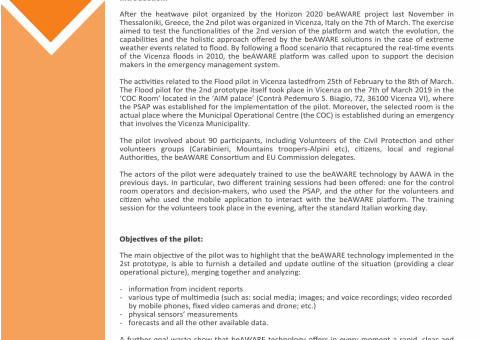 A series of trainings have taken place the last week to prepare volunteers and officers about the beAWARE test event about floods on 7 March in Città di Vicenza. Participants were coming from various civil protection organisations like the Municipal Civil Protection, the National Alpine Association, and the National Carabinieri Association. The volunteers will participate in the event on 7 March, communicating information and receiving operational indications from the Municipal Operative Center (COC) through a special app. During the meeting the technicians of the Municipality of Vicenza and of the River Basin Authority of the Eastern Alps district illustrated the functionalities of the app.